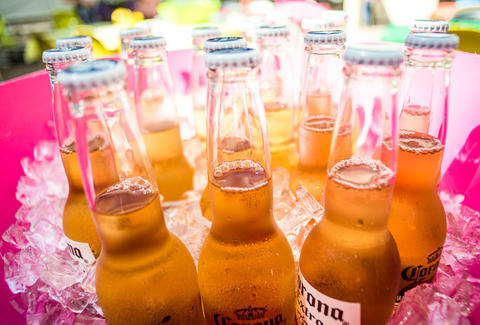 That delicious Mexican beer you drink when you want to imagine you're on a beach (even though you're in a cramped, dark studio apartment) may become much more expensive in the near future, according to a new report from VinePair. Trade policy is not the sexiest of topics, but it relates to beer here, which means it's important to understand. See, if President-elect Donald Trump follows through on his proposal to rip up NAFTA, a free-trade agreement between the US and Mexico (and Canada! ), the price of Mexican beer could go up. This is because the agreement currently allows the three countries to trade beer duty-free -- as in, without tariffs that artificially drive up the price. So without it, the price to import Mexican beers would likely jump. Trump's plans for NAFTA also affect how much it would cost companies to make the beer. Mexican breweries currently purchase millions of bushels of grain from the US quite inexpensively. But without the trade agreement, the price of barley would also likely increase, VinePair added. But there is hope -- some argue that Trump might not actually be able to get rid of NAFTA. So for now, let's all crack open an ice-cold Mexican beer, and be thankful it's still blessedly cheap. Lee Breslouer is a senior writer for Thrillist, and needs a few Mexican beers right now. Follow him to beach beers @LeeBreslouer.